BOSTON — Almost two weeks ago, the Democrat-controlled Legislature approved what would be the state’s first budget in excess of $40 billion. Republican Gov. Charlie Baker said not so fast Monday to the already scaled back $40.2 billion spending plan. Baker planned to sign a budget for fiscal 2018 that includes $39.4 billion in spending after he vetoed $320 million from the plan, and went even further than House and Senate budget negotiators to revise tax revenue projections downward for this year by $749 million. The governor also returned to the Legislature a new assessment on employers that he initially proposed to help pay for growing MassHealth expenses, calling on lawmakers to act quickly to package the $200 million in new employer fees with MassHealth reforms that lawmakers laid aside during budget deliberations. One assessment, considered a tax by many, would boost a per-employee fee paid by employers, known as the Employer Medical Assistance Contribution, from $51 to $77 per year. The second would hit employers with penalties of up to $750 per employee if their workers choose MassHealth even though they have access to insurance through their employers. Baker wants the Legislature to package those assessments, plus a freeze in unemployment insurance rate increases also approved by lawmakers, with a five-year moratorium on new health insurance mandates, the transition of hundreds of thousands of enrollees from MassHealth into subsidized, no-premium health plans offered through the Connector and expanded scope of practice for new mid-level dental therapy providers. The administration, according to Health and Human Services Secretary Marylou Sudders and Administration and Finance Secretary Kristen Lepore — who was named Baker’s chief of staff Tuesday — will also seek through the budget amendment to get permission for a federal waiver to erect a “gate” blocking full-time workers with access to affordable employer-sponsored health coverage from being eligible for MassHealth. 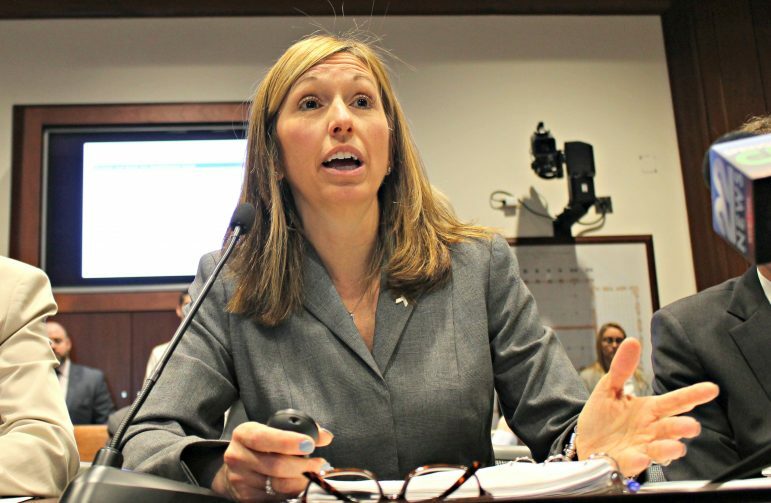 Lepore said that without the assessments and MassHealth reforms, the budget signed by Baker will have a $350 million hole that would require adjustments in spending, including the possibility of future mid-year budget cuts. Baker is essentially using the threat of future spending reductions as leverage for a deal over MassHealth reforms. He is asking for a hearing on his budget amendment within 30 days, and his proposal arrives in the House amid shakeups in leadership positions dealing with the budget and health care. His action will likely be greeted with support from the business community, who worked with the administration to develop the plan but opposed the Legislature’s inclusion of the assessments in the budget without the reforms seen as key to controlling future Medicaid growth. The remainder of Baker’s proposal to reform MassHealth, which was first presented to budget negotiators in late June, will be filed in separate legislation, including new provider price disclosures, changes to tiered network products offered by insurance carriers and other scope of practice expansions. Lepore said the MassHealth budget in fiscal 2018 will total $15.6 billion, a 3.7 percent increase over last fiscal year. With the reforms proposed by Baker, the administration hopes to hold enrollment growth — currently at about 1.9 million people — to 1.6 percent. Overall, the budget signed by Baker on Monday accounts for a $652 million spending increase over last year, or 1.7 percent. Tax revenues are projected to grow by 3.4 percent, including $181 million in updates to the tax code that are expected to accelerate the growth by changing the way sales taxes are collected and requiring online retailers that do significant business in Massachusetts to collect and remit sales taxes from customers. Some online retailers, such as Amazon, already collect sales taxes for the state. Lepore said the administration’s projections for tax revenue in fiscal 2018 are $99 million lower than the estimate used by the legislative conference committee and $749 million below the number agreed to back in January before tax revenue growth slowed to a trickle during the spring months. The governor’s budget chief also said that the $104 million reserve set aside in the House-Senate plan to pay for expected deficiencies in accounts for snow and ice removal, indigent counsel services and sheriffs is $94 million shy of what will likely be needed. Baker’s vetoes included $222 million from MassHealth and $42 million in earmarks. He also vetoed nine outside sections that officials said were mostly related to duplicative reporting requirements at the Department of Children and Families and some newly proposed commissions. 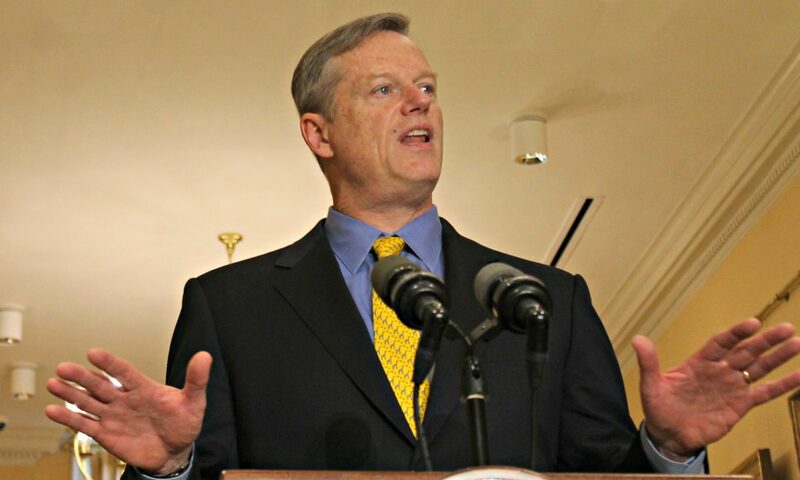 Despite the reduction in anticipated revenue, Baker did not turn to local aid to find savings and stood behind a 3.9 percent increase in unrestricted payments to cities and towns totaling over $1 billion and $4.75 billion in local school aid, or a 2.6 percent increase. Other spending initiative highlighted by the administration were $3.5 million for a new State Police division focused on counter-terrorism, $28 million for DCF to support 450 new hires at the social services agency, a $9 million increase to nearly $93 million for rental vouchers and $13 million to support 45 addiction treatment beds for women at Taunton State Hospital.